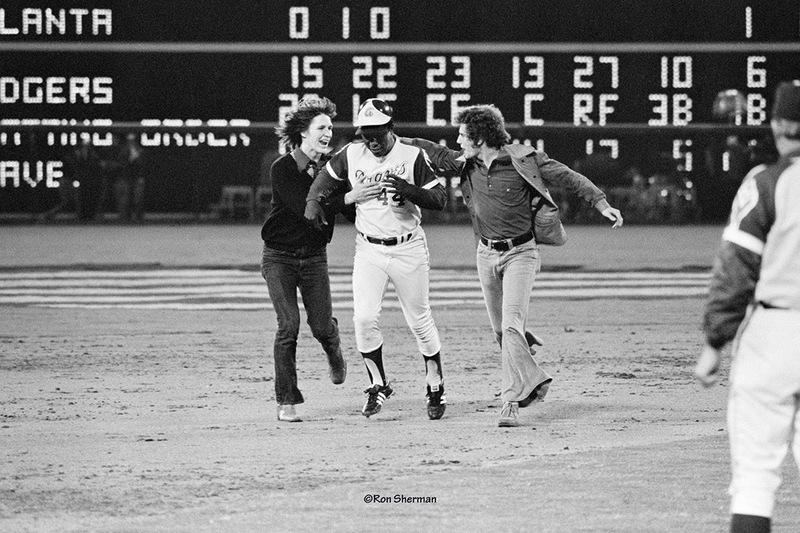 This image of Hank Aaron rounding the bases after home run No. 715 was taken by Ron Sherman ’64 (photography). The home run broke Babe Ruth’s record. Ron Sherman ’64 (photography) can tell you exactly what he was doing on April 8, 1974. And now so can baseball fans. Sherman was at Atlanta-Fulton County Stadium with more than 100 photographers capturing the moment Hank Aaron hit his 715th career home run, breaking Babe Ruth’s 39-year-old Major League record. When Aaron rounded second base, he was joined by two fans who had jumped the rail and run onto the field. Sherman made what has become an iconic image from the photo box along the third base line. 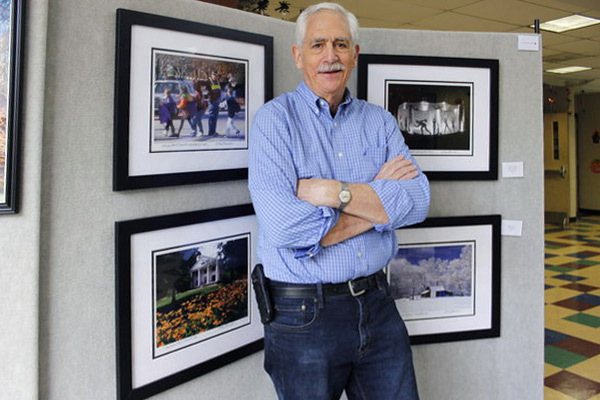 Ron Sherman ’64 (photography) works as a photographer in Atlanta. Sherman said his name was never attached to the photo because UPI transmitted it using only his initials in the caption. A few days later, the photo editor at UPI asked Sherman if UPI could borrow the negative to make a print for the New York office. He turned the negative over to them, still not thinking much of it. The negative stayed in the UPI archives, which were sold to Bettmann Archives and then later acquired by Corbis Corp.
Sherman checked the archives of The Associated Press, local and national newspapers, photo agencies and magazines and he said he couldn’t find another published photo like his. He reached out to Corbis and after some negotiation he was able to get the negative returned in 2006. End of story, he thought. Until last fall when a friend was visiting the National Baseball Hall of Fame and Museum in Cooperstown, N.Y.
Sherman’s photo was included, unattributed, in an exhibit called, “Hank Aaron: Chasing the Dream.” Sherman called the museum and told them his story. Erik Strohl, vice president, Exhibitions and Collections at the National Baseball Hall of Fame and Museum, said Sherman’s credit was added to the exhibit last October. That pleased Sherman, who has spent his career working as a self-employed photographer based in Atlanta covering everything from Jimmy Carter’s campaign for the presidency to the Olympics. Sherman is in the process of producing a book with his photo collection. The photo of Hammerin’ Hank will be included. He hopes to one day get to the National Baseball Hall of Fame to see his photo on display. The National Baseball Hall of Fame and Museum has displayed Sherman’s photo of Hank Aaron since 2009. The museum added a photo credit last October.